While we are at Disney World soon and our whole little family is going to be participating in the Tower of Terror 10-miler Weekend. Andrew and I are running in the 10 Miler and Perry (with mommy in tow) is running in the Kids Races 100 meter dash. The 10 Miler is a night run, starting at 10 pm. We are so thrilled that Gary and Ann are able to come with us and make it a big family trip. And they are going to spend a fun night with all three kiddos in our room, so that Emily, Matt, Andrew and I can all run. Meanwhile Perry, Ben and Kate are all running in the Kids Races that morning. RunDisney knows how to put on a fun race and after party and we can't wait to see what all is in store. Part of the fun of running a Disney race is planning race costumes, and seeing all the creative costumes others put together. Since it is Tower of Terror (aka creepy) themed, I am running as the villain Cruella DeVil. 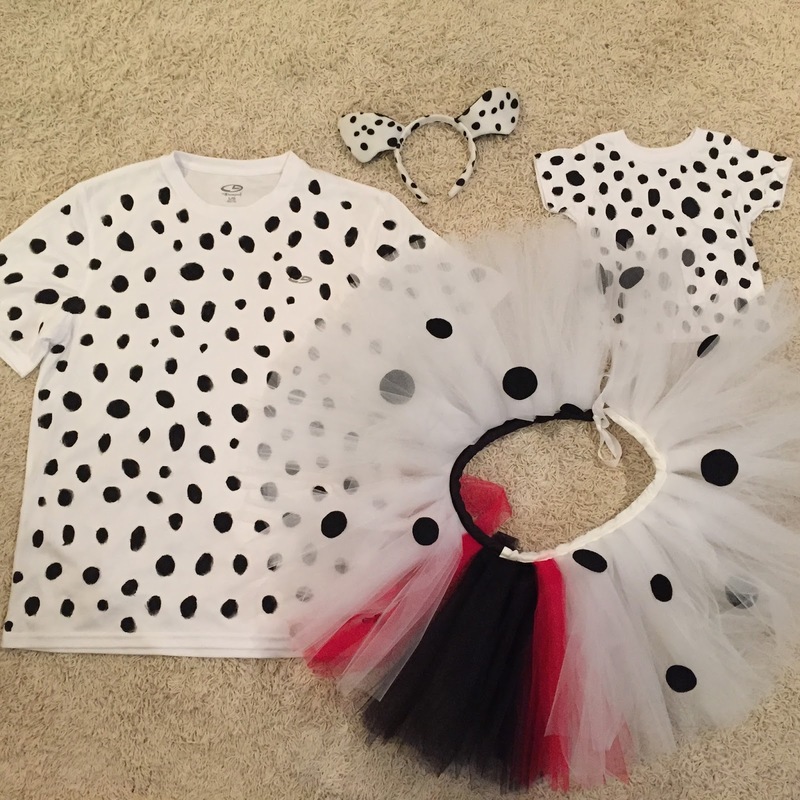 I asked the sweet lady on Etsy who made my Cinderella tutu for the princess half to design and make a Cruella tutu. It turned out super cute. My two boys are going to coordinate and run as dalmatians. Only need 99 more for a complete set. I just painted black spots on white shirts for both P and A and ordered an ear/tail set off of Amazon. Any bets on how long we can convince Perry to keep the puppy dog ears on his head? I am thinking not long. I have had Perry's done for a while now but just finished Andrew's tonight. There are just a few more black dots on Daddy's shirt. I think we are now all set to run (or run/walk or whatever we wind up doing to finish). I can't wait to see it all put together. And see all the other costumes people have dreamt up!